Hall of the Mountain King: Review: Eddie Ojeda, "Axes to Axes"
Review: Eddie Ojeda, "Axes to Axes"
When you think of great guitarists, Twisted Sister's Eddie Ojeda isn't the first person you think of - or even the 15th. In fact, if his name does come up, it's probably in one of those late-night, drunken naming sessions that's gone on way too long. I'm not knocking him as a player, just pointing out that he's not someone you usually think about. 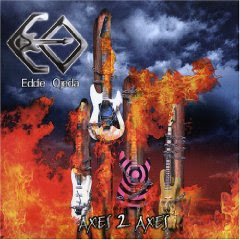 That's why I was a little surprised when I got a copy of Ojeda's solo album "Axes to Axes." But Ojeda doesn't go in for the instrumental wankfest that you expect from a guitarist's solo album. 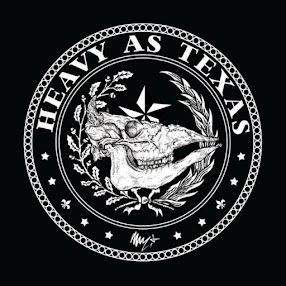 There are a few showpieces here, but for the most part, he sticks to his strength, and that's writing punchy, undeniably catchy hard rock and metal tunes. It also doesn't hurt that the album gets some heavyweight help on the opening track from Ronnie James Dio. Rudy Sarzo, Joe Lynn Turner, and of course, Twisted Sister bandmate Dee Snider also put in appearances. The guitar work here is solid, if not awe-inspiring. The riffs are great and the melodies hook you, but there's nothing lead-wise that makes me want to run grab my guitar and say, "man, I've got to figure out how he did that." Ojeda does cover a lot of territory here. "Please Remember" is a great 1970s hard rock song, and Ojeda's voice works very well for that style. He also flirts with funk on "Love Power" and Spanish stylings on "Senorita Knows." But by and large the biggest sound here is that of early Twisted Sister. The shining moment on the album is his collaboration with Snider on the surprisingly menacing cover of the Beatles' "Eleanor Rigby." It's a galloping cover with Snider delivering the vocals in a mocking tone that fits perfectly. The funk-rocker "Love Power" is another strong moment, and of course Dio's appearance alone makes "Tonight" a memorable tune. While most of the songs here are quite good musically, lyrically it's another story. Ojeda isn't very strong in that department, and it shows on songs like "Evil Does (What Evil Knows)". This is a nice, old-school Dio-style song that would have been great if they lyrics weren't so painfully awkward. It was intended to be a historical epic, and it comes closer to being a hysterical epic. Take the first verse: "In the minds of ancient leaders/only power rules/the only thing worth fighting for was gold and jewels/as they learn from their sins and mistakes, they become rich fools/now all their people will die cause they must rule." The fact that Ojeda delivers the vocals with such grave seriousness and drama only serves to make it more cringeworthy. I make fun of "Evil Does" because the lyrics are easily the worst of the album, but other songs don't fare much better in that department. Dio helps out by putting his golden pipes to work to improve "Tonight" by giving the lyrics more gravity, but other songs don't benefit from the stateliness of a Dio. If Ojeda finds a good lyricist to work with and just focuses on the guitar work, I think he's really got something to build a solo career on. Lyrics aside, the songs are otherwise strong, and "Axes to Axes" is a pretty damned good album from a surprising source.